Since the dawn of humanity, a privileged few have lived in stark contrast to the majority. Conventional wisdom says this gap cannot be closed. But, according to a book by Diamandis and co-author Steven Kotler, it is closing – fast. 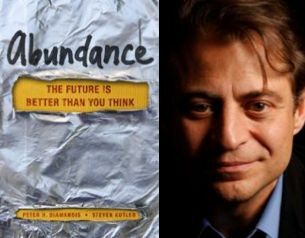 ABUNDANCE – THE FUTURE IS BETTER THAN YOU THINK documents how progress in artificial intelligence, robotics, infinite computing, ubiquitous broadband networks, digital manufacturing, nanomaterials, synthetic biology, and many other exponentially growing technologies will enable us to make greater gains in the next two decades than we have in the previous two hundred years. They believe we will soon have the ability to meet and exceed the basic needs of every man, woman, and child on the planet. After 3.8 billion years of R&D on this planet, failures are fossils. What surrounds us in the natural world is what has succeeded and survived. So why not learn as much as we can from what works? Nature, imaginative by necessity, has already solved many of the problems we are grappling with. Animals, plants, and microbes are the consummate engineers. They have found what works, what is appropriate, and most important, what lasts here on Earth. 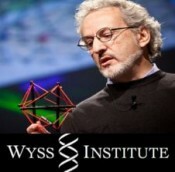 In January 2009, Harvard received the largest philanthropic gift in its history — $125M — to create the Wyss Institute for Biologically Inspired Engineering, and today’s guest is its founding director, DON INGBER. I find this whole notion of imitating nature one of the most exciting developments in human activity and something that gives me great hope. The human body is an engineering marvel that maintains its balance while executing complicated movements, and senses and adapts to heat and cold. Every 20 seconds, it circulates blood through its extremities. Its cells are able to replace wounded tissue, find and destroy dangerous invaders, and interconnect to produce thoughts and emotions. Our bodies – and all living systems – accomplish tasks far more sophisticated and dynamic than any entity yet designed by humans. By emulating nature’s principles for self-organizing and self-regulating, Wyss researchers develop innovative engineering solutions for healthcare, energy, architecture, robotics, and manufacturing.